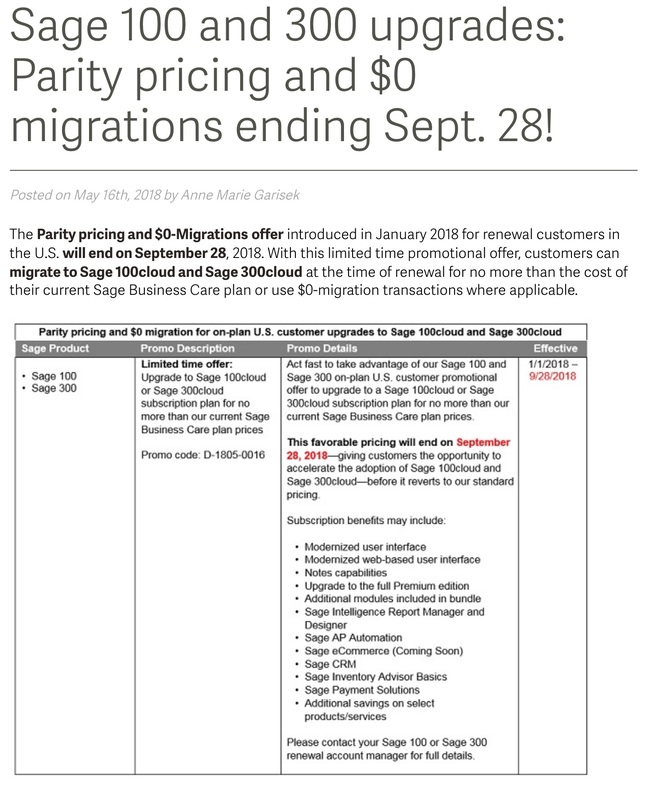 Sage has just notified us that their migration promotion which is available for any Sage 100 perpetual user active on maintenance will cease on September 30, 2018. This promotion allows perpetual license holders to migrate their perpetual license to subscription (aka Sage 100cloud) for the same price as their perpetual renewal. 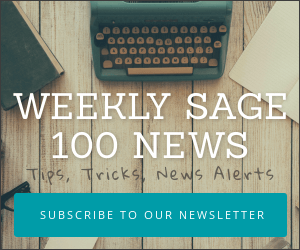 Once migrated, Sage indicates that future price increase will adhere to limitations as set forth in their EULA which is presently no more than 10% per year. 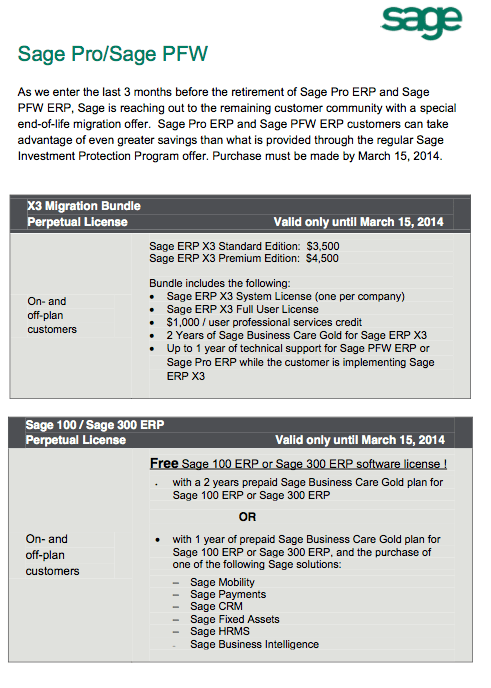 If you are using Sage 100 under a perpetual license we recommend migrating prior to the expiration of this offer. Please note that the migration fee only covers your regular Sage maintenance and any add-ons such as Sage Payroll, or third party enhancements are in addition to your Sage 100cloud subscription. For more information on the costs to migrate your Sage 100 perpetual to subscription please contact your Sage business partner. Schulz Consulting is an authorized consultant for Sage 100 and Sage 100cloud. We also operate the local DSD Business Systems Glastonbury Connecticut office where we locally manage the sales of Sage licensing for DSD Business Systems. DSD Business Systems has 37 offices in 21 states. This past week I was asked if it was possible to upgrade a very early version of Sage 100 (previously known as MAS 90 or MAS 200) from a level as early as 3.71 to the current version which is Sage 100 2016. In short, the answer is usually yes. Sage 100 Premium may migrate from 3.74 to 3.71 Providex which is possible with a tool provided by Sage. Essentially this downgrades your data files to Providex. From there upgrade to Sage 100 Standard 4.4 and finally Sage 100 Premium 2016. If you do a test migration and then go back and remigrate data – which of the elements (roles, forms, UDF, etc) will remain and which will be overwritten? Your customizer data and UDF’s remain in tact, as well as security. However, your Reports under the company data folder will not. Also any module specific settings will need to be reimplemented.